Young children naturally develop values-based behaviour in a values-based atmosphere. The child-centred activities in the updated and expanded Living Values Activities books for children ages three to seven include circle groups with discussions and reflections on values, peace tents and the opportunity to enjoy and explore values through imagining exercises, stories, "Quietly Being" exercises, songs, games, art, play, movement and a myriad of values activities. Activities for developing intrapersonal and interpersonal social and emotional skills, including communication skills, inclusive and protective social skills and conflict resolution, are included. The activities foster the development of peaceful, caring cooperative social skills, and involve children affectively, cognitively, socially and artistically. Some of the activities can be adapted for children two years of age. The eight values units in Living Values Education Activities for Children Ages 3–7, Book 1 are Peace I, Respect I, Love and Caring, Tolerance, Honesty, Happiness, Responsibility, and Simplicity and Caring for our Earth and Her Oceans. Book 1 is designed to be used during the first year of implementing the Living Values Education approach and alternate years. 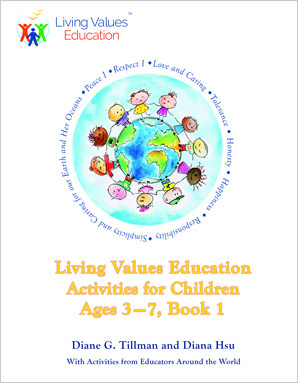 Living Values Education Activities for Children Ages 3–7, Book 2 contains another eight values units: Peace II, Respect II, Cooperation, Brave and Gentle, Humility, Another Value We Love, Freedom and Unity. It is designed for the second year of implementation and subsequent alternate years. A variety of songs are included in the LVE lessons for children ages three to seven. You can download the songs to hear the melody or to play them for the children. Children benefit in many ways from learning and singing the songs together — and doing so builds feelings of happiness and belonging. The creators of the Joy of Reading Project kindly gave permission to the Association for Living Values Education International for the posting of some of their stories on this website. The stories below were chosen because of their relevance to a particular value. Each pdf file states the values unit in which the story is included; the name of the story and author are stated in the relevant lesson of the book.